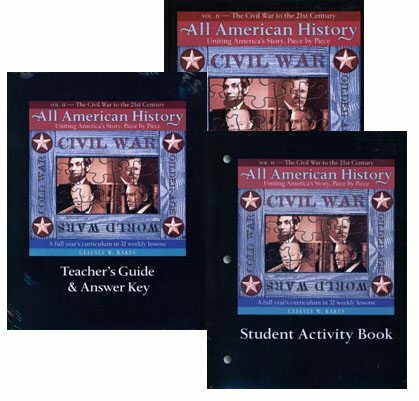 Like all good stories, each volume’s 32 weekly lessons set the scene and the historical atmosphere of the events at hand, unfold the events in vivid narrative style, and then explore the impact each event had on the nation’s future. Whether at home or in a classroom setting, teachers will appreciate the wide variety of hands-on activities and further research ideas offered in the Teacher’s Guide, along with helpful teaching tips, answer keys, timeline information and pictures, and a great book list! Explore America’s vibrant history, one story at a time. The Teacher’s Guide is the heart of this course. It includes schedules, timeline information and pictures, forms, book lists, answer keys, games, hands-on projects, and more. For families with elementary-age students, there are adaptations for younger students as well. Order the Student Reader, Student Activity Book, and Teacher’s Guide as a packaged set and receive a 15% discount!